Oh, eMusic... what a roller coaster ride it's been. I started on eMusic back when they offered unlimited downloads. Looking back, those days were unbelievable; I had the download manager running pretty much all night, and their jazz collection was great, even in those early days. Lots of the OJCs, free jazz,etc.. The reggae/ska/international selection was pretty damn good too. I felt a bit guilty, but most of the albums were in 128 Kbps, so I convinced myself that it was all good. They got wise and stopped the unlimited downloads, and for a while their subscriptions were good value. Then they got greedy and threw longtime subscribers under the bus in the quest for big money and major labels. Like Shawn, I bailed right around the time the majors starting showing up. I also remember when Circuit City was selling $25 eMusic booster pack cards for some ridiculously low price ($4.99 maybe?, or even less than that). I grabbed all the cards I could find, and when it was all done I downloaded over 200 albums at an average price of about 30 cents per album. The eMusic message boards were hilarious... the complaints that there was no "real" music there to download (before the majors showed up), the complaints about the download manager (to be fair, it was hot garbage most of the time), and the angst about longtime subscribers getting the shaft... so much drama. Maybe I'll head back there to check on the fallout of this new direction for eMusic. Yep, Bird, Diz, and Flip in the front line. There are three takes of "Hallelujah," two takes of "Get Happy," two takes of "Slam Slam Blues," and five takes of "Congo Blues." That's it for the first disc. The Marmarosa material (11 tracks) has been released several times before. The Garner material totals 14 tracks (3 tracks on disc 4, 11 tracks on disc 6)... I have no idea why they were spread across two discs when all that material could have easily fit on a single CD. What does a "Modern Jazz on Dial" set mean? I gather that was a label? When? Who was on it? I've got the 10CD set of the "Complete Dial Masters" that was put out on Spotlight/Toshiba-EMI back in 1995 or so (TOCJ-0001 to TOCJ-0010). Here's a rough breakdown of what is on that release (these are the names on each disc): CD 1 – Red Norvo All-Stars (12 tracks, 43:47) CD 2 – Dizzy Gillespie & Modern Trumpets I / Charlie Parker Septet (19 tracks, 54:37) CD 3 – Charlie Parker Quintet / Night Music by Howard McGhee / Woody Herman Woodchoppers (21 tracks, 65:59) CD 4 – Charlie Parker Home Cooking Session / Charlie Parker Quartet / Erroll Garner Trio (24 tracks, 62:12) CD 5 – Charlie Parker All-Stars / Saxophone Moods by Dexter Gordon (16 tracks, 47:24) CD 6 – Cocktail Time by Erroll Garner (11 tracks, 34:02) CD 7 – The Chase by Dexter Gordon & Wardell Gray Quintet / Charlie Parker Quintet (21 tracks, 66:41) CD 8 – Charlie Parker Quintet / James Moody & His Saxophone (21 tracks, 64:41) CD 9 – Piano Moods by Dodo Marmarosa / The Duel by Dexter Gordon & Wardell Gray (18 tracks, 60:49) CD 10 – Charlie Parker Sextet / Dizzy Gillespie & Modern Trumpets II (22 tracks, 60:08) Some of these discs are a bit short on time, so I can't see Mosiac just replicating these 10 CDs in their set. If there's more than this, I can't wait to get it! Let me know if you want to part with one of them. The Tower on Sunset will always hold a special place in my heart. I found so much great stuff in there (and spent obscene amounts of $$$)... I must have stopped by there at least once a week. Amoeba is great, but Sunset Tower was something else. Good story, and a great quote! That was Dan Skea, and I don't really know what became of the RVG project. He did publish an article on RVG a number of years back: http://jazzstudiesonline.org/files/jso/resources/pdf/RudyVanGelder.pdf I seem to recall that the RVG project had some fairly lofty ambitions behind it... I'd love to know what's happened with it. I've never had a problem with the typeface. There are only a few artists about whom I can honestly say my life was forever changed by having heard their music. 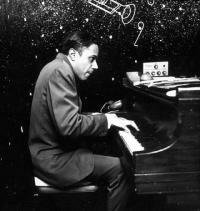 Horace Silver was one of those artists. He was on the very first jazz LP I bought as a teenager (Sonny Rollins, Vol. 2), and my life changed the second I heard that piano. There is no way I could ever quantify how much joy his music brought into my life. Thank you Mr. Silver, for everything. May your beautiful spirit continue to soar! Great run by the Kings, some amazing games in each of the series they played. Maybe the most mentally tough team I've seen in a long, long time. As a Flames fan, I'm happy to see Sutter get his second Cup. I'm even more ecstatic that Regehr finally got to hoist the Cup! What, a "prejudice" that it won't sell and they'll lose money on the deal? Cuscuna digs the Three Sounds, but he knows that they won't sell a lick... and I'd imagine the bigger the box the less likely folks will want to shell out the cash for it. I'd buy it for sure (even though I have all of their BN work that's been released here in the US and in the JRVG series), as would many/most on this board. So there's a good 50 sales, tops. Who else is going to buy the other 4950 sets? Primarily: Jazz = 1955-1965 Punk = 1976-1986 Can't be without: Ska/Rocksteady/Reggae = 1964-1974 If I could pick any two specific eras in time to see live music, though, it would be: 1.) Emergence of Bop (to see Bird, Bud, Monk, Diz in the early days would've been magic). 2.) Emergence of Punk (I sort of lived this, but was just a bit too young... to see the Clash live in 1977, for example, would've been insane).